When choosing an elemental diet as a dietary intervention, practitioner-patient communication is of utmost importance. Understanding the onboarding process, potential roadblocks or deviations, and an exit strategy can prepare both patient and practitioner. Mapping out a successful protocol starts with an in-office visit, followed by frequent check-ins both during an elemental diet and while transitioning off one. What changes may occur while starting an elemental diet? How does this deviate from one’s current diet? While the experience of transitioning to a full liquid diet from solid meals can be a focus of patient concern, one should not discount the lifestyle advantages of doing so. Within a two-week timeframe, the average American spends between $85.00 and $168.80 on food. Additionally, they spend hours on grocery shopping, cooking, and meal preparation; all of which is minimal while on an elemental diet.3 When starting the elemental diet, a practitioner should work together with the patient to determine daily caloric intake. An online dosing calculator that takes into account a patient’s height and weight, age, and activity level is a convenient tool to bookmark and use in the planning phase when starting an elemental diet. Once intake is determined, patients can easily divide their daily caloric intake throughout the day. Should one be concerned about abdominal cramping? Elemental diets are typically concentrated, resulting in a high osmolality, which can sometimes create occasional cramping. The first question that should be asked is, “how quickly are you drinking the solution?”1 Drinking fast or “gulping” can often lead to abdominal cramping. If this occurs, it is recommended to increase dilution and slow the rate of consumption. What is life like after an elemental diet? Simply said, food reintroduction requires a patient to be patient. At the end of either a full or half elemental diet, patients are usually eagerly anticipating the introduction of solid foods. When making the transition, it is typically recommended to slowly reduce the caloric intake of the elemental diet and to begin incorporating well-tolerated foods. This can be especially supportive when coming off a full elemental diet. Specialty diets such as low-FODMAP or Specific Carbohydrate Diet (SCD) can be helpful and may ease symptoms when starting to include food. Patient-practitioner communication is key not only during an elemental diet, but also when transitioning off one. 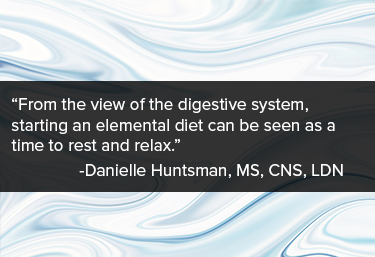 Danielle Huntsman, MS, CNS, LDN is a certified nutrition specialist and licensed nutritionist. She holds an MS in Nutrition and Integrative Health from Maryland University of Integrative Health and is a graduate of the College of Charleston. Danielle has a special interest in gastrointestinal and endocrine health, supporting clients through an integrative approach with proper diet and nutrition. She actively sees clients remotely and within the Philadelphia area. Giacosa A, Guido D, Grassi M, et al. Effects of Ginger (Zingiber oficinalis) and Artichoke (Cynara cardunculus) Extract Supplementation on Functional Dyspepsia: A Randomized, Double-Blind, and Placebo-Controlled Clinical Trial. Evid Based Complement Alternat Med. 2015;2015:915087. Stasi C, Bellini M, Bassotti G, et al. Serotonin receptors and their role in the pathophysiology and therapy of irritable bowel syndrome. Tech Coloproctol. 2014;July18(7):613-21. Official USDA Food Plans: Cost of Food at Home at Four Levels, U.S. Average, November 2018. (2018). United States Department of Agriculture. Available at: https://www.cnpp.usda.gov/sites/default/files/CostofFoodNov2018.pdf [Accessed 27 Dec. 2018].